The title “Topography (Re)newed” is a play on the influential 1975 photographic exhibition "New Topographics: Photographs of a Man-Altered Landscape" at the George Eastman House in Rochester, New York. Photographers including Lewis Baltz, Robert Adams and Stephen Shore took a deadpan look at the American landscape populated by industrial office parks, gas stations and strip malls. Their work contrasted sharply with prior romantic views iconocally represented by the glorious “nature” of Ansel Adams and the mystical photographic poetry of Minor White. 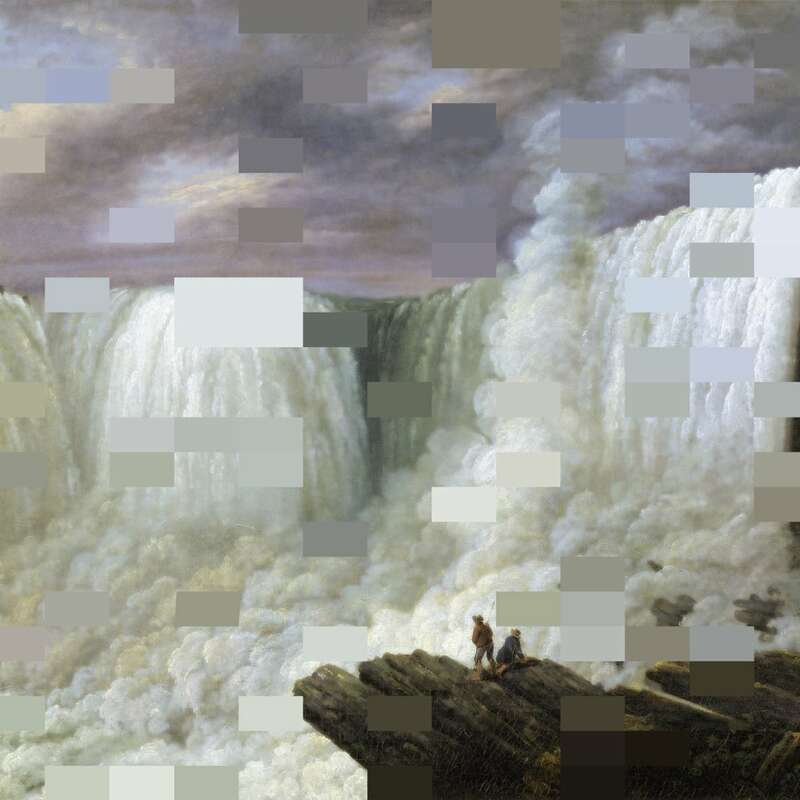 A half-century later, “Topography (Re)newed” revisits the question of how we render the American landscape, applying a conceptual map (driven by computer languages, large data sets, and new technology business models) that was unavailable to past generations in this particular tradition in visual art. The works in “Topography (Re)newed” unite two discrete ways of seeing landcape: traditional realism and abstraction. 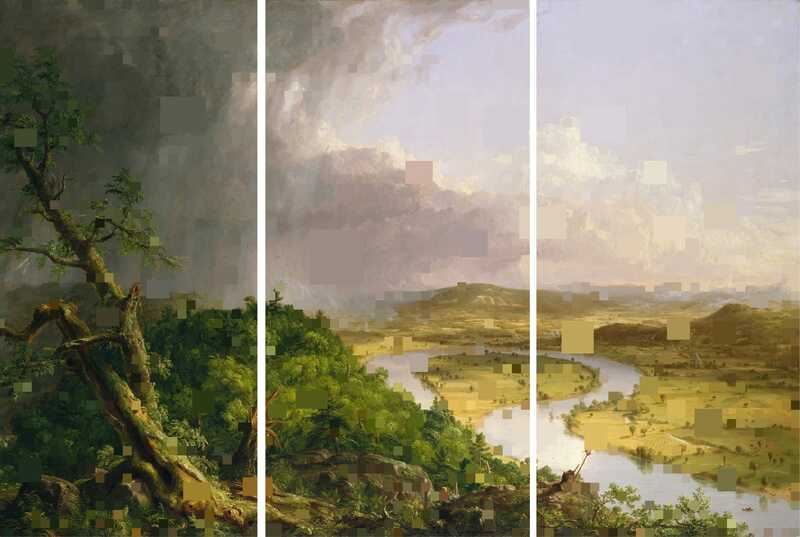 The realistic view appropriates images from mid 19thcentury landscape paintings by members of the Hudson River School, including Thomas Cole, Albert Bierstadt and Frederick Church. Abstraction enters by reducing aspects of these images to squares and rectangles of solid color drawn from the area of the landscape they cover. Production of works in “Topography (Re)newed” involves a sampling technique that references methods of statistical and scientific analysis as well as sampling techniques employed in rap and house music. Taking a meta approach to making art, I appropriate and (re)new works from the history of painting, employingthe methods of the Pictures Generation artists like Barbara Kreuger and Sherrie Levine. 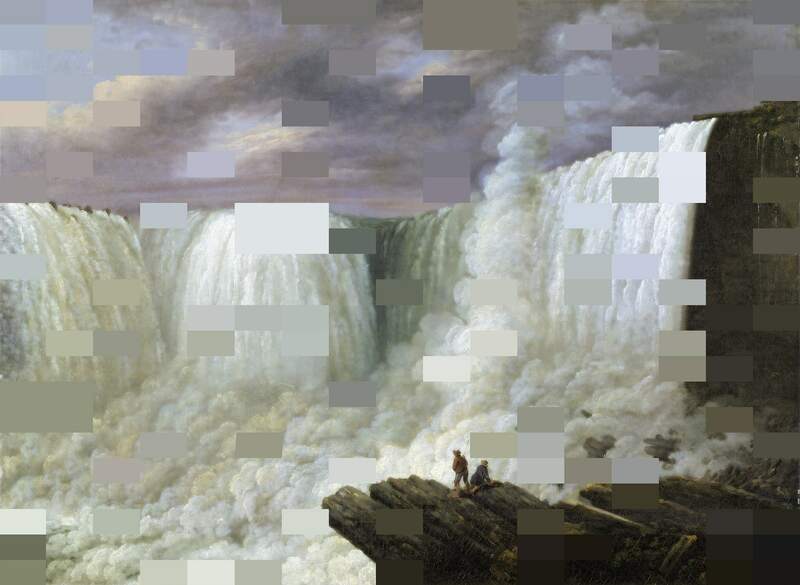 By sampling 19thCentury landscapes whole-scale or in large part, using a scanner and Adobe software programs in place of a camera and chemistry, and by conflating painting with photography, I place the medium and the message in new territory and make the machine part of the message. Paradoxically, while there is degree of analytical remove in the formulation and production of this project, its products are seductive and beautiful, sparking pleasure in viewers in much the same way as the Hudson River School landscapes did in their time. The Hudson River School painters were based in New York City, but traveled widely into the American landscape to draw and paint, accompanying some of the Western Survey expeditions. While the artists themselves largely held a Transcendentalist, Romantic view of nature as a source of wonderment and spiritual renewal, their works had a mutable quality, as many photographs do, and sometimes bolstered views antithetical to their beliefs. 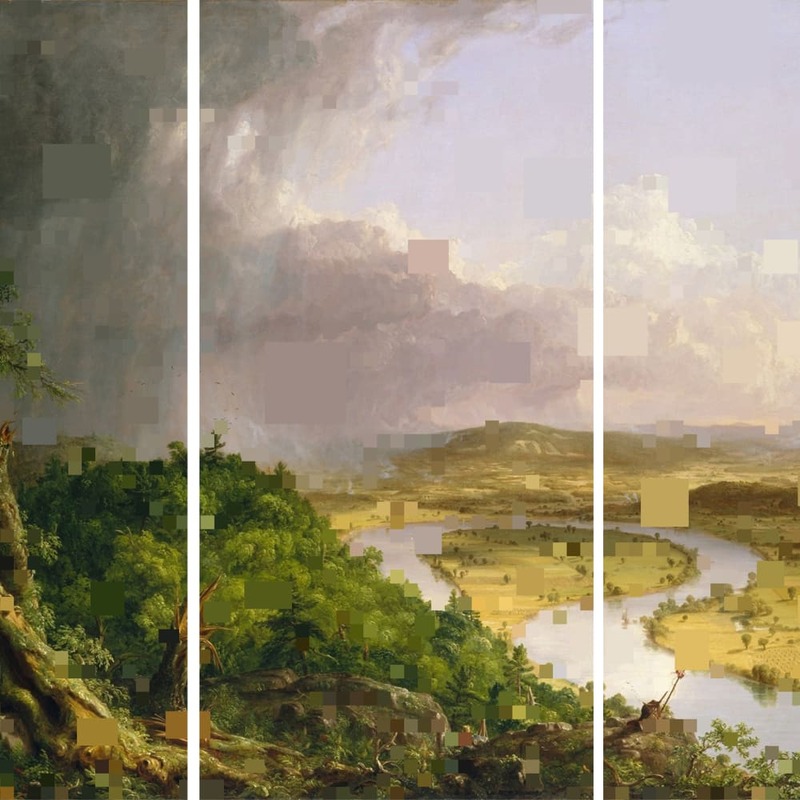 In this connection, their landscapes, whether pastoral, sublime or picturesque, were sometimes used in support of mid 19thcentury ideas about America and manifest destiny, about land as a commodity and economic resource to be exploited. Our landscape, our territory and our world-view are now made up of information as much as they are comprised of the physical terrain. In its current form, manifest destiny expresses its driving expansionism in the formation of data (panels) landscapes and methods of mining these data fields for profit. Technology companies are annexing friendship, social psychology, human biology, and the library of the world for private gain. This Westward expansion is awesome, fascinating and frightening, and its implications are enormous. The Hudson River School painters were criticized by later artists for their anthro-pocentricim, for putting humans first in the natural order. Now, as we embrace machine logic and big data, humans are quickly and casually being swept to the side. What does it mean when the construction and assembly of the world we imagine as landscape is increasingly done from inside the networks of machines?